As I previously mentioned, this past Friday my friend Amy (who loves to take pictures as much as I do and loves exploring cemeteries as much as I do!) and I packed up the girls and made the 2-hour trip west to the small village of Sleepy Hollow just up the Hudson from New York City. A dispatching buddy had mentioned to me awhile back that it was probably someplace that I would enjoy as there are some mega-awesome graves there and, of course, there's the legend of Sleepy Hollow and Ichabod Crane being chased by the Headless Horseman to entice visitors also. It sounded like it was right up our alley so we set off Friday morning for a little bit of an adventure. I've decided that the best way to do a post is to actually do several posts being that I took way too many pictures - again! Besides, that way I get to relive the trip again and maybe throw in a little extra history for those of you who enjoy it as much as I do. For those who don't, well ... I hope you enjoy the pictures! 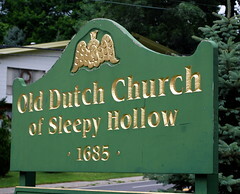 So, let's start with the Old Dutch Church of Sleepy Hollow, which sits adjacent to the Sleepy Hollow Cemetery, shall we? 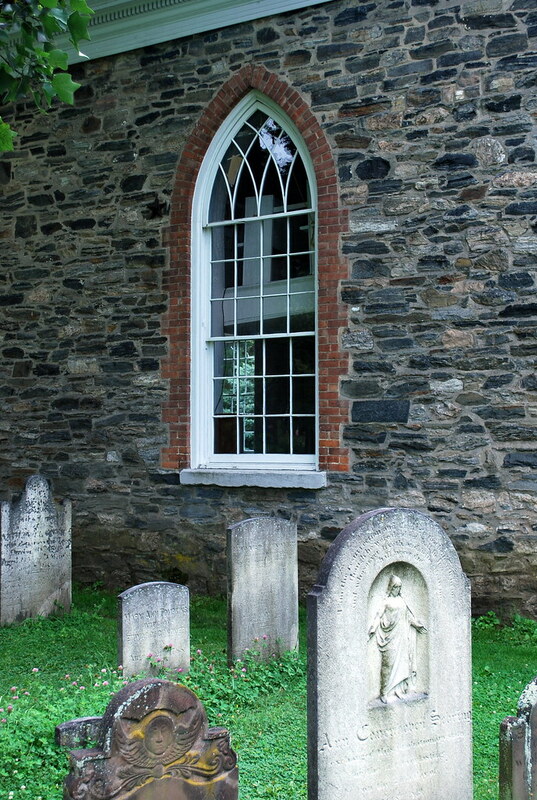 The Old Dutch Church of Sleepy Hollow and its accompanying 3-acre burying ground are the setting for Washington Irving’s short story The Legend of Sleepy Hollow; it was in this cemetery that Irving's unfortunate character Ichabod Crane sought refuge from the Headless Horseman. 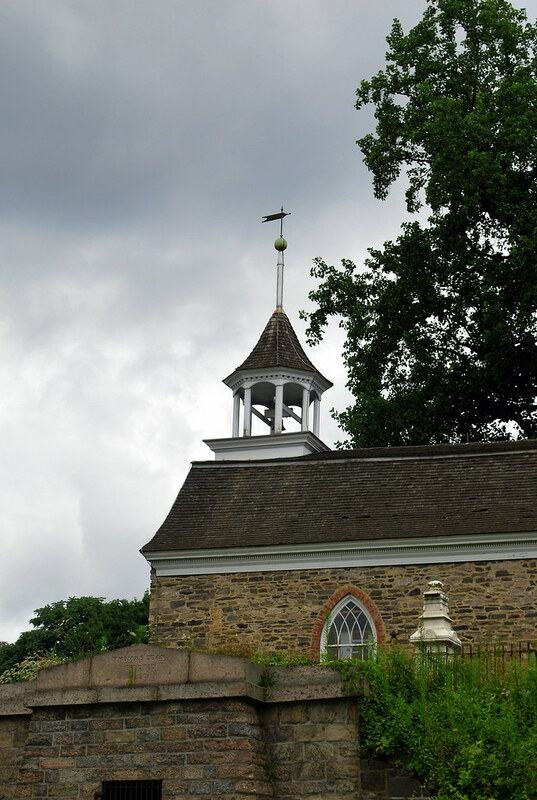 The church, whose walls are about two-feet thick and composed of local fieldstone, was constructed around 1685 on what was then the manor of Frederick Philipse, Lord of Philipse Manor, whose 52,000 acre landholdings stretched from Yonkers to Croton. 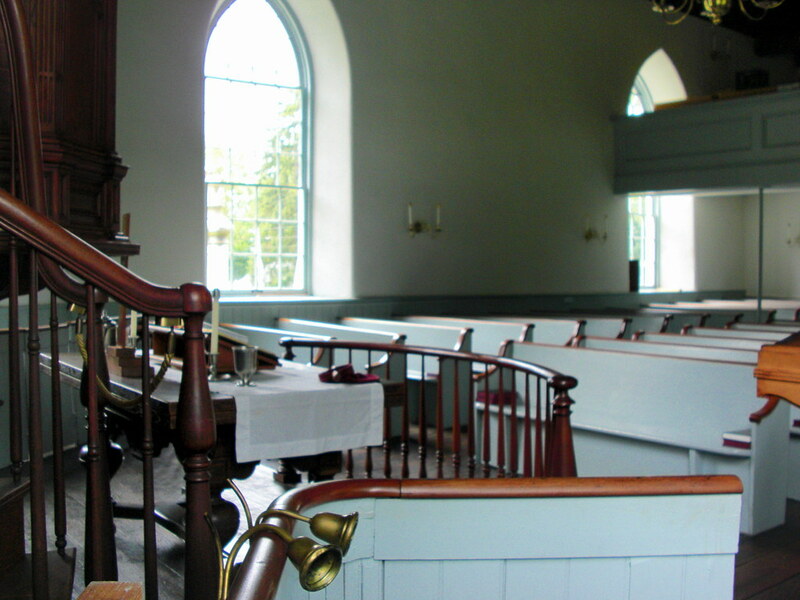 The congregation was formally established in 1697. The original bell, which was cast in the Netherlands, still hangs in the open-air belfry. Its inscription is from the book of Romans, Chapter 8, Verse 31: "Si Deus Pro Nobis, Quis Contra Nos?" - "If God be for us, who can be against us?" Though the church has undergone some alterations over the years, nothing has been changed that would make it unrecognizable to a member of the congregation from a generation past. 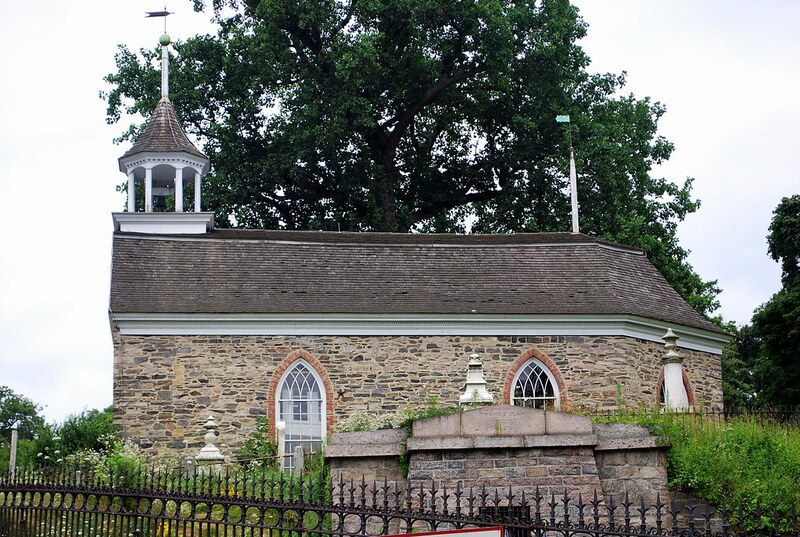 When the Albany post road was rerouted from east of the church to west, the door was moved from the south wall to the west wall and the original small, square windows were replaced with the current large, pointed arches; beyond that, it remain as it did in the late 1600's. In 1963, the church and grounds were designated a National Historic Landmark by the United States Department of the Interior. 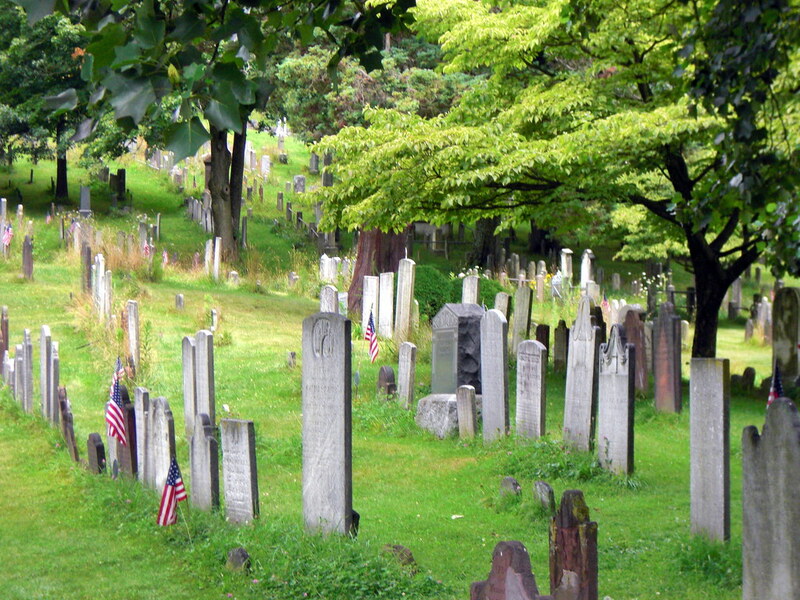 The Friends of the Old Dutch Burying Ground, a not-for-profit organization, was established in 1984 to preserve the landmark as well as educate the public about its historical significance. Tours are available and services are still held at The Old Dutch Church on Easter, Christmas Eve, summer services, and occasional weddings. 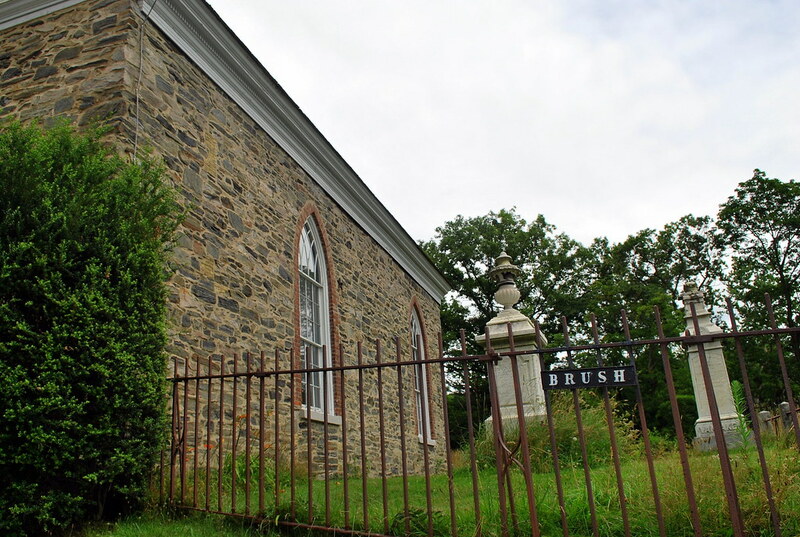 The burying grounds at the Old Dutch Church are often confused with Sleepy Hollow Cemetery but they are not related except by proximity. 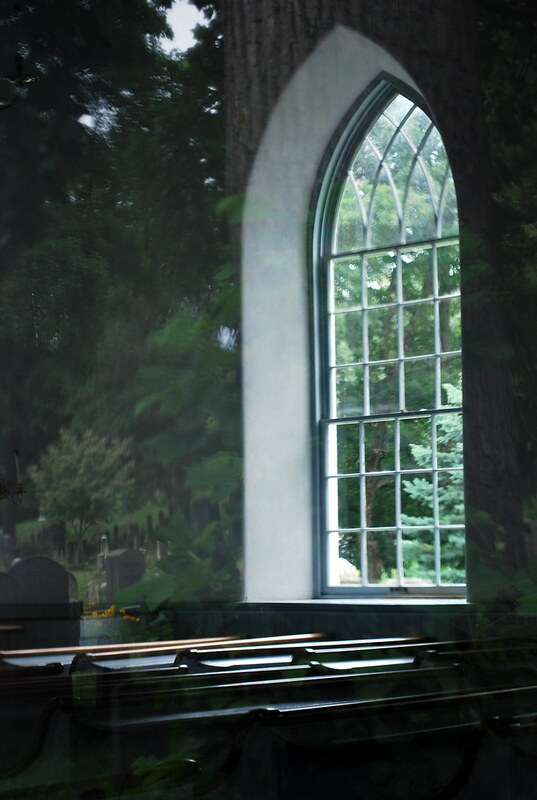 We weren't able to tour the inside of the church but we did walk around outside and take pictures through the windows. At over 300 years old, the church is one of the oldest standing churches in the State of New York and it speaks volumes about the volunteers who care for it that it is in as wonderful shape as it is. I know by European standards that's probably not all that old but by American standards it most definitely is! 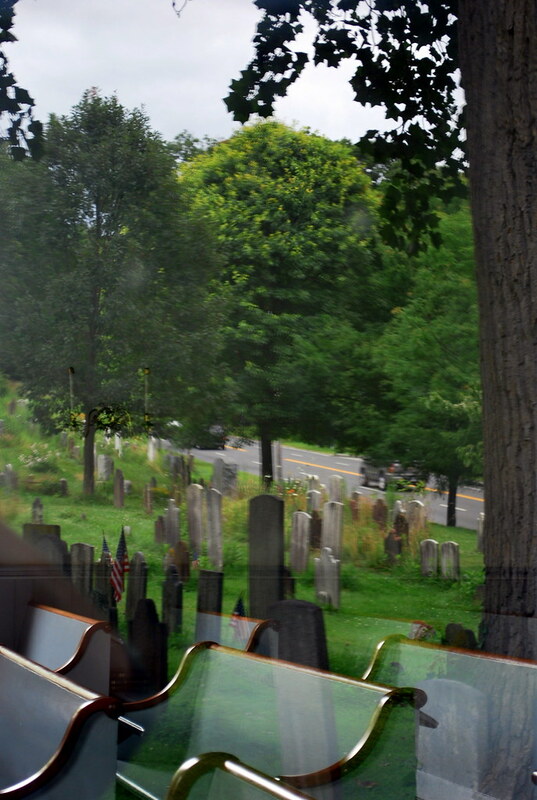 I like the way the windows reflected the burying grounds outside in these two pictures above. I think they kind of add to that "eerie feeling" you're supposed to get when visiting the place! 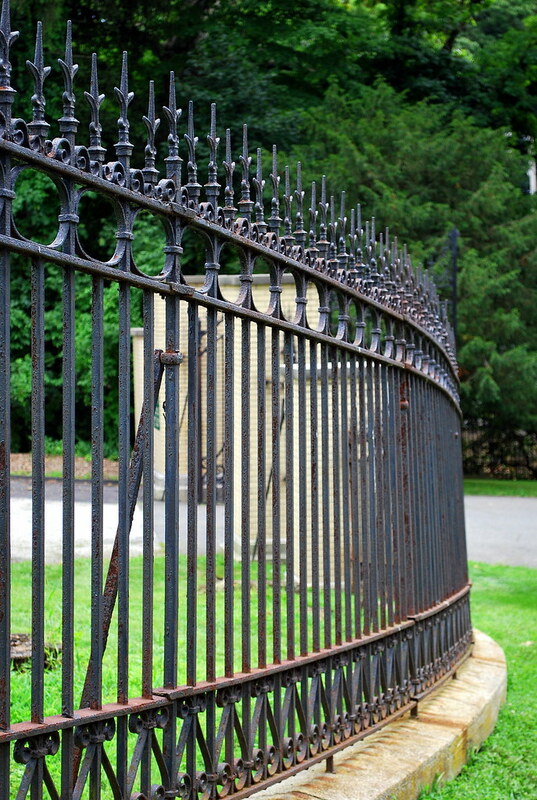 Next installment will be the Sleepy Hollow Cemetery! I love all the window shots!! How creepy....also Happy Birthday Jaime. I've just mentioned it in the previous post. This is going to be a great series. I didn't want to stop reading. How fun. I would love to visit here as well. Your photography is awesome. Will await your next installment. Oh I love this post. You know I love cemeteries!! The window shots were very intriguing! Nice job, Linda. 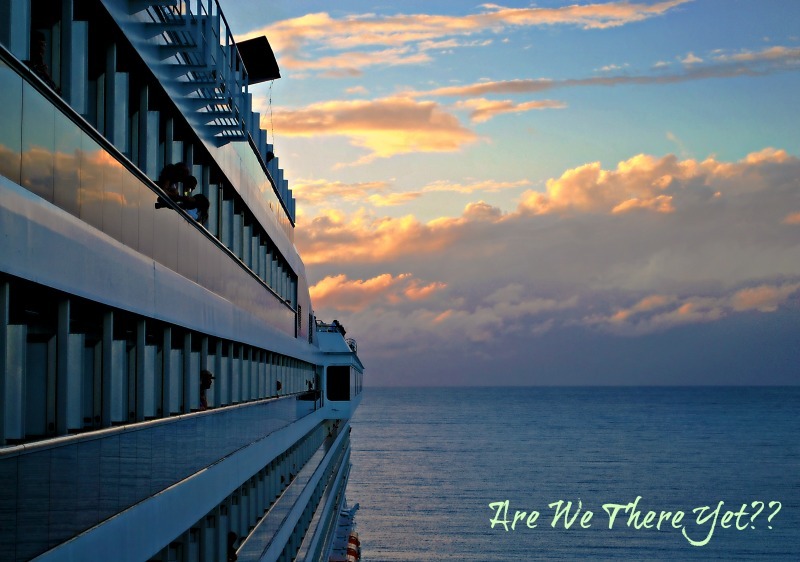 I would have loved to be able to go with you. Oh what fun!!! My favorite is the last one. nice job. This church is my denomination! I didn't know that until reading this post! The church I attend now is more German in it's roots but I did attend a Dutch Reformed church many years ago. I really appreciate seeing these pictures and plan on more research. Thanks! One thing about our modern culture, is with the drop in church attendance, the evolution of the modern church, and the fact that we are so mobile, we no longer have a cemeteries attached to our churches. We tend to place our cemeteries out in the boonies so we aren't constantly reminded of the fact that we're mortal! The older churches have graves of families going back several generations. I think it's a shame we've lost this sense of community. Oh, oh...love the photos AND the history lesson. Thanks!!! ONce again... love the pictures... especially the reflecting ones. the photos are wonderful...the history is an added bonus. I'm off to read Parts 2 and 3. P.S. I love the window shots with the reflections. Love the architecture. I keep telling myself that I need to get out and see some of the things that are within a day trip from my home. But somehow I never do it.